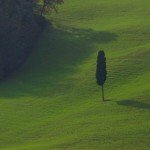 Some of the best Classical Dressage training in Europe! 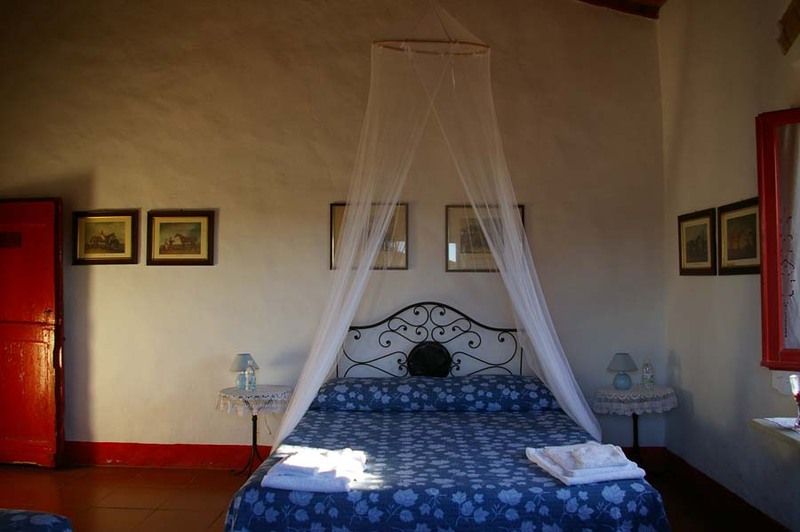 High season: 6th April to 12th October & Christmas period 26th December to 6th January. 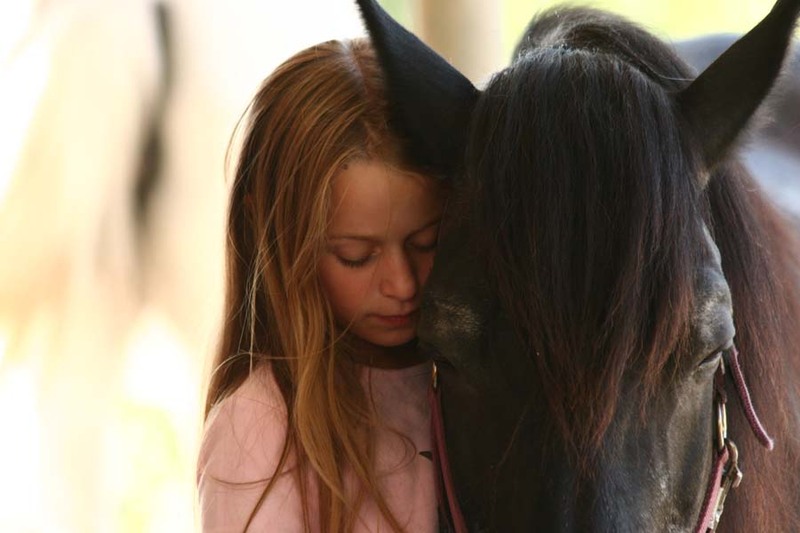 Children’s Programme – Mostly lessons, some riding out if child is proficient. 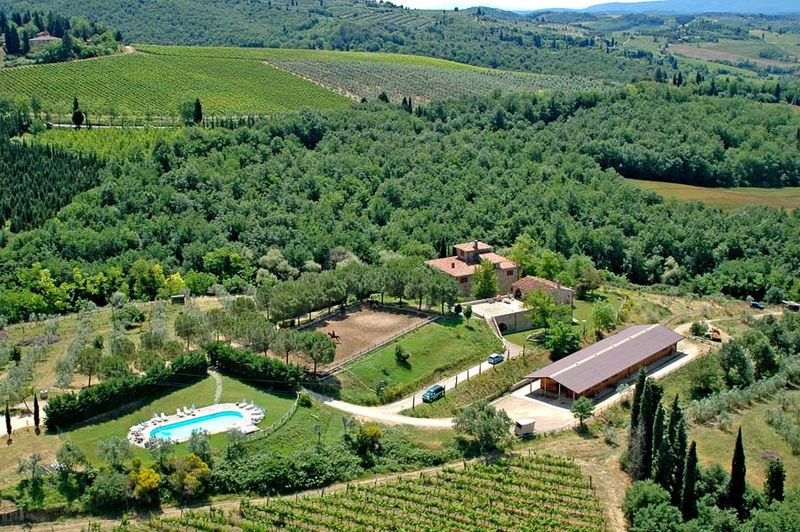 Included – All the riding, half board accommodation, drinks & Chianti wine with meals. 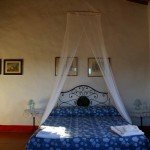 Excluded – Flights, transfers, tips & lunches. 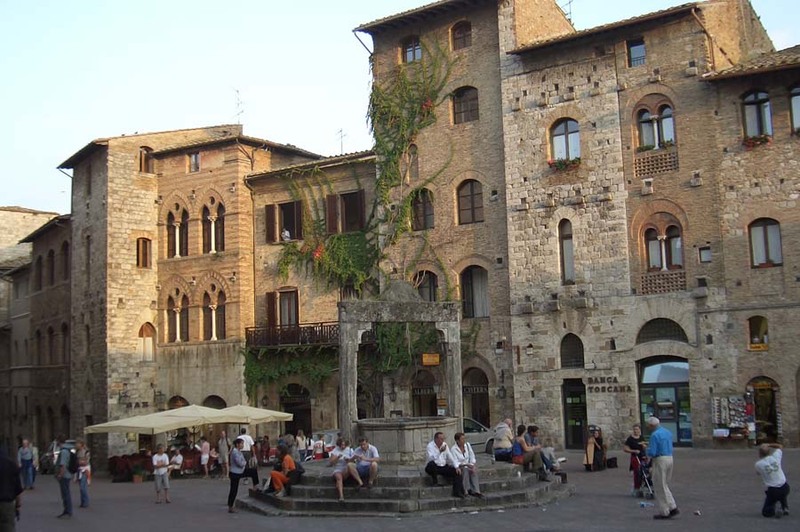 International flight to Florence or Pisa. Prices based on per car each way up to 4 passengers. 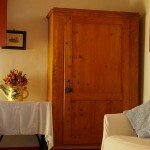 Open from 16th March to 10th November & from December 26th to January 7th, other periods on request. 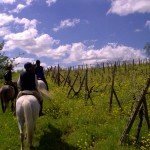 A fantastic horse riding holiday in Italy, which combines horse riding through the beautiful Tuscan countryside with some of the best and most empathetic, classical dressage training in Europe. 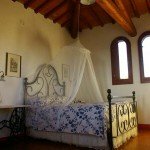 Your hosts Giovanni and Cristina de Marchi, have been classically trained by Albert Moyerson, a pupil of the late Nuno Oliveira and taking a dressage lesson here is a real delight. 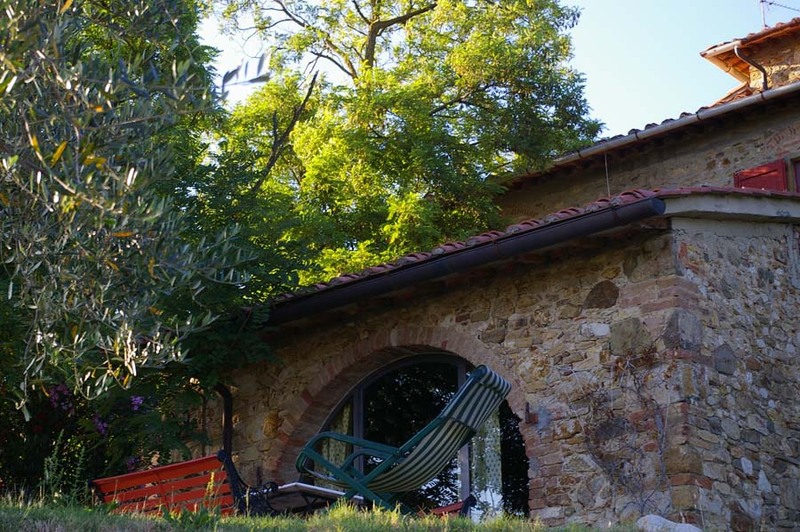 Situated in the heart of Chianti country, this Classical Dressage holiday offers a wonderfully flexible agenda, from lessons to hacking out on wine and olive tasting trips to visiting mediaeval villages nearby, or simply hanging out at the pool after a morning’s riding lesson. 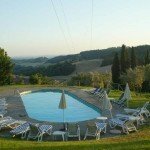 Of course, you are in Italy so the food is worth a mention… dinner during your Classical Dressage holiday is a social event and served at a long table at the heart of your Tuscan Villa, where you are joined by other guests. The meal is 4 course, and beautifully cooked by Cristina’s own mother. 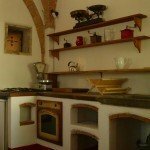 She uses the freshest of ingredients, which is locally sourced, served with home baked bread and washed down with good Chianti wine. Always a perfect way to end a perfect day. 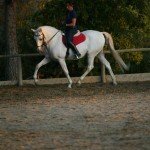 Classical Dressage : Horses – Lusitanos, Arabs, Anglo-Arabs, Sella Italiano, Holsteiner, KWPN, Maremmano, Merens & Children’s Ponies. 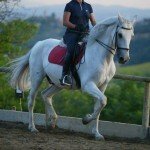 Classical Dressage : Level of Riding & Pace – Beginner to Intermediate. Groups are organised so that similar levels of riders are together. Lesson sizes are kept small, so that each guest gets individual attention (expect 3-4 people being taught at any one time). 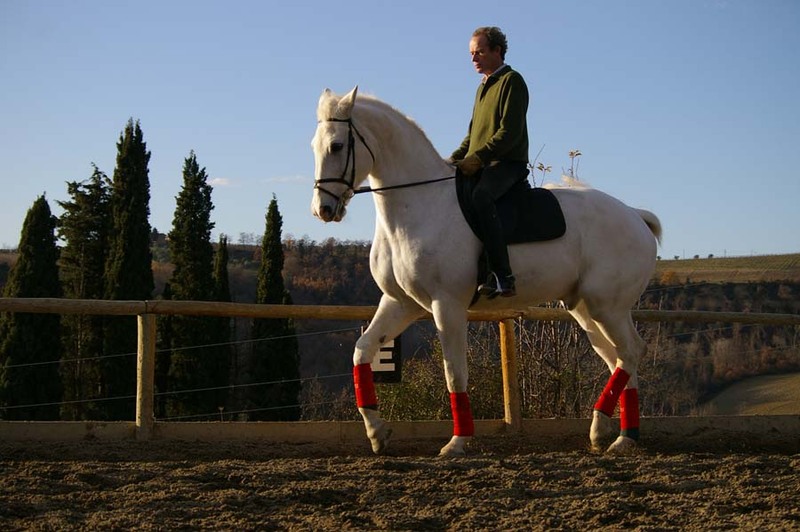 Classical Dressage : Tack – English. 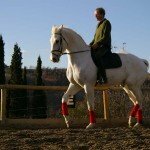 Classical Dressage : Weight Restriction – 14 stone / 90 kg / 198 lbs. 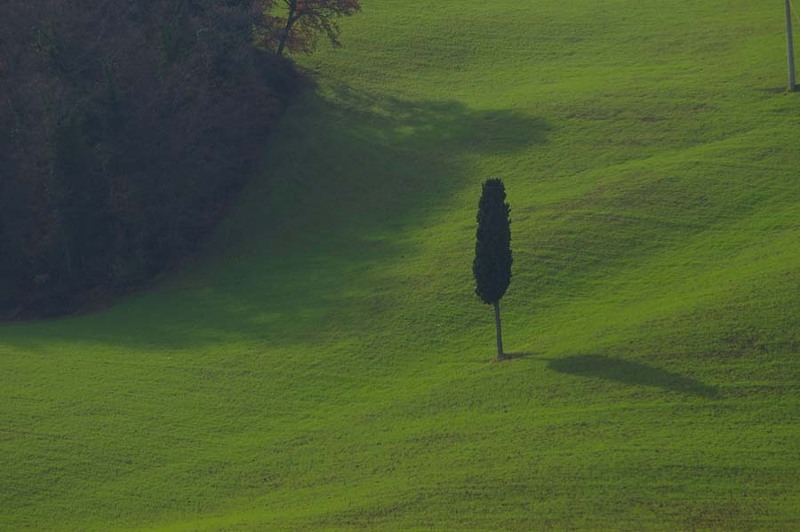 Classical Dressage : Group Size – Maximum 4. 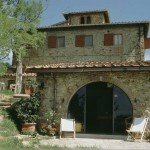 During your Classical Dressage holiday you will stay at Il Paretaio – a typical Tuscan 18th century, country villa, simply & tastefully furnished in an Italian country house style, all rooms ensuite. 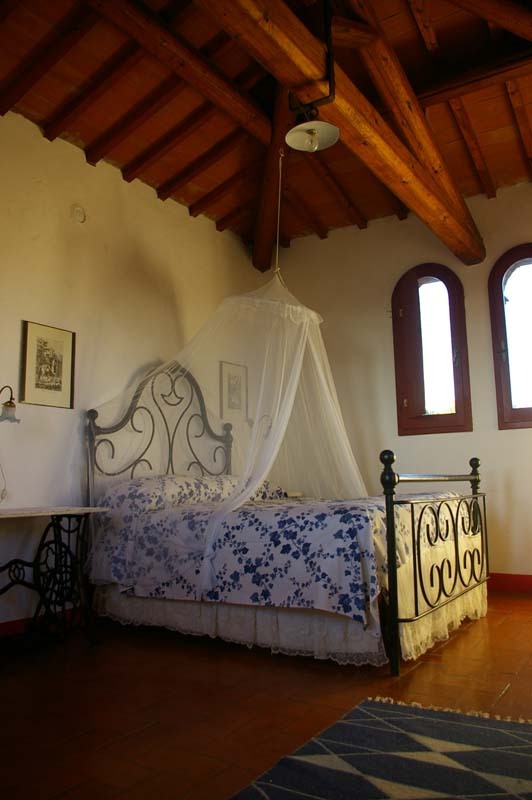 In addition to the main house there are 2 lovely apartments which suits families with young children. 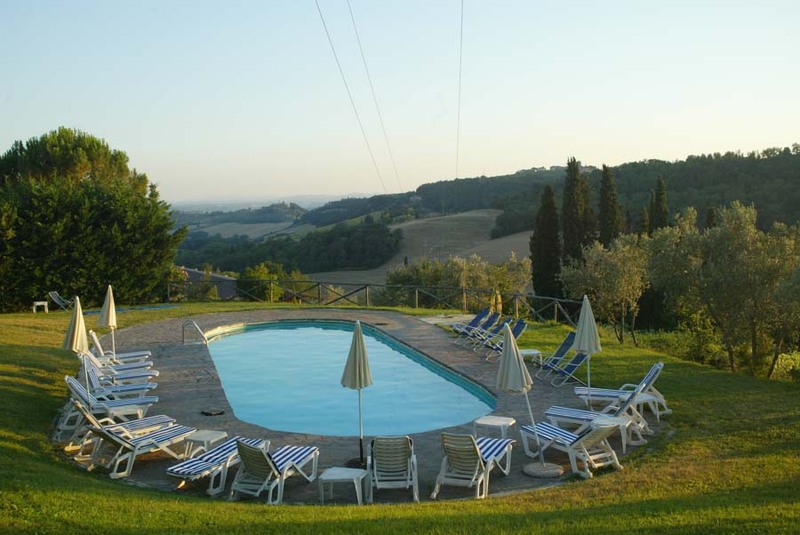 There’s also a lovely outdoor swimming pool with plenty of lounging areas. 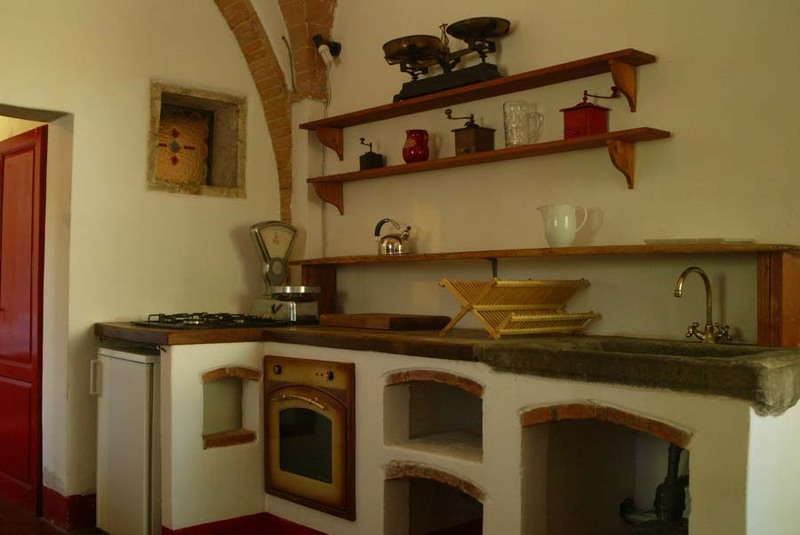 As mentioned before on this Classical Dressage holiday, the food is simply delicious – breakfasts are light and continental, fresh bread, cheese, hams and preserves. 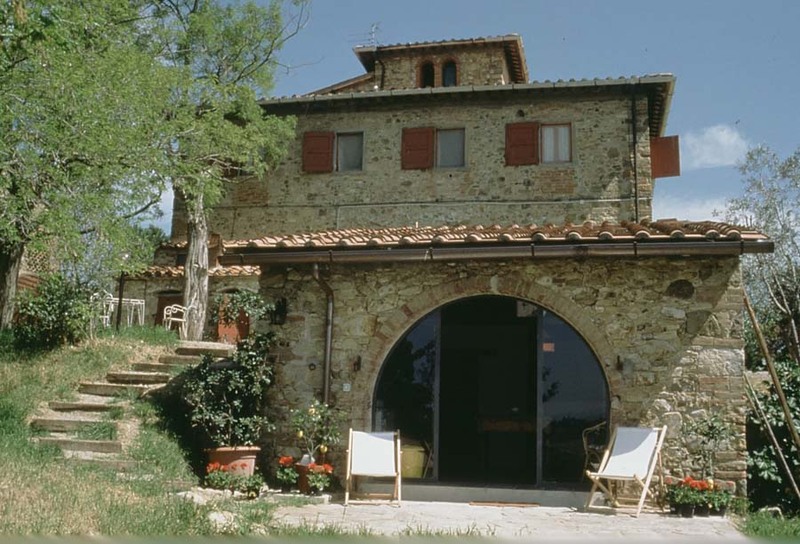 Lunch can be taken at the villa if pre ordered the day before, however most guests take this time to get off the yard and visit a nearby town and have lunch. 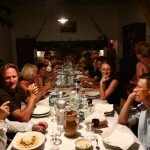 Dinner is a 4 course event, and very sociable. 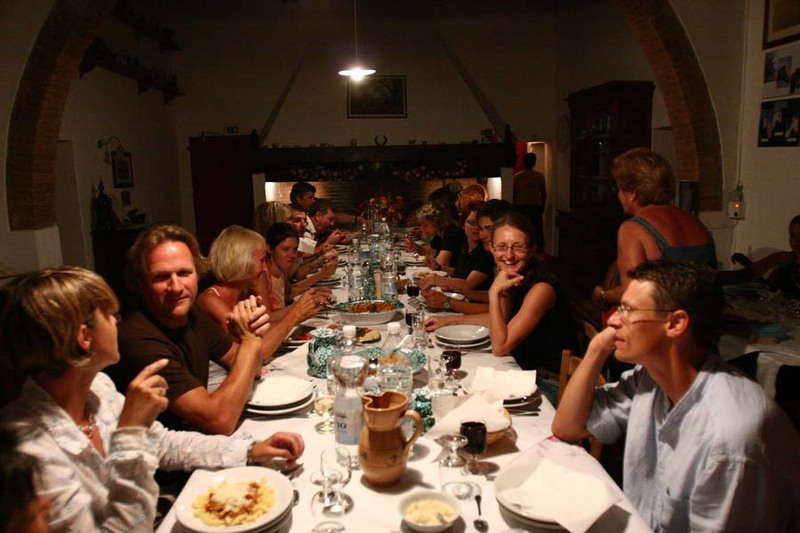 Everyone sits down together at one long table, catching up with each other and talking about the days events – it’s a very relaxed, enjoyable affair, accompanied with some really great local wines. 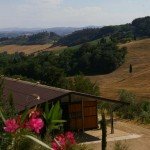 Horse Riding Holidays like our Classical Dressage Tuscany, are part of the Zara’s Planet collection of Horse Riding Holidays Italy. 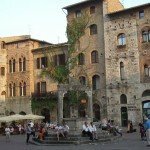 Il Paretaio is a very good base for touring this area of Tuscany as many cultural attractions are close by and include Florence, Siena, Colle Val d’Elsa, San Gimignano, Certaldo, Greve in Chianti, Pisa, Pienza, Volterra and Lucca. 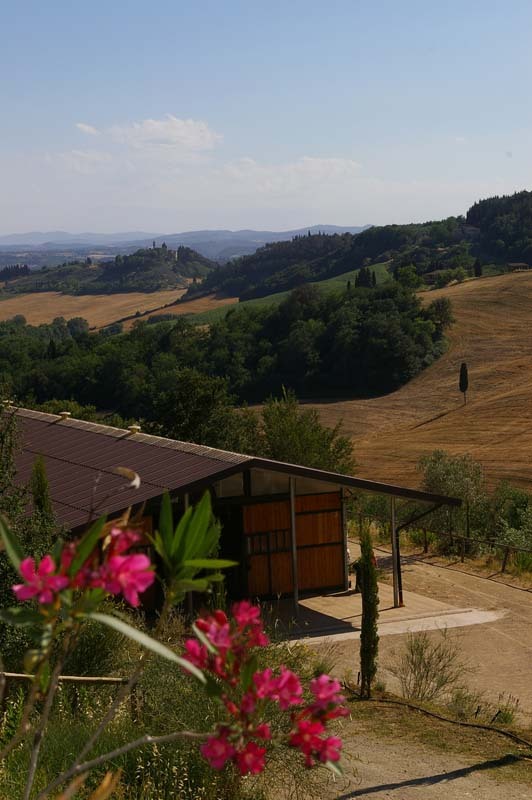 In general, the Classical Dressage riding programmes will leave you with plenty of time to tour the area, lots of the places mentioned are less than a half hour car drive away from the villa. 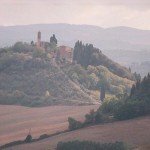 You will find 30 well-trained horses (Lusitanos, Anglo-arabs, Berber, Arabs, English Thoroughbred and Italian horses) as this special place in the Tuscan countryside. 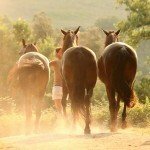 The horses are carefully selected for you to ride according to the skills. Beginners can learn riding from the very first steps. 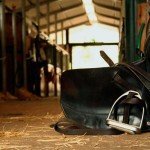 Post-beginners can extend their knowledge and skill by participating in lessons or riding out. The quality of tuition is very high and instructors and guides are BHS, GEA, FISE UISP qualified. 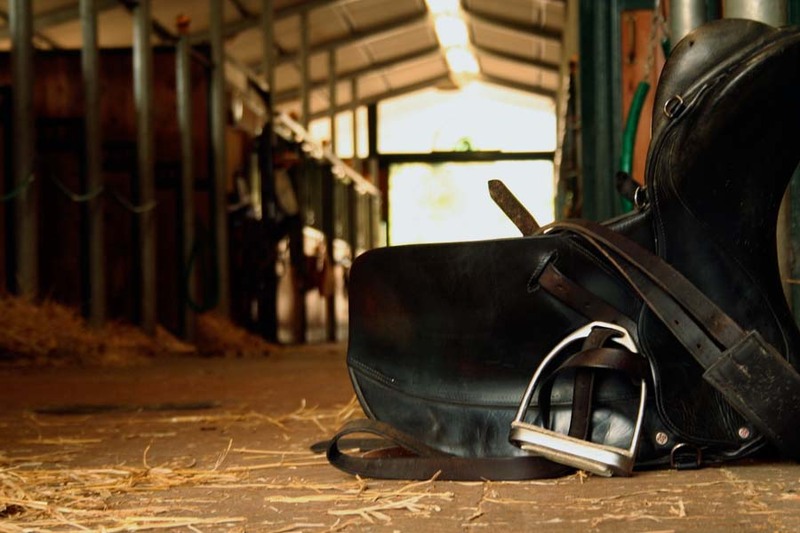 Riding lessons are taken in one of the two training arenas and are in English. The groups are a maximum of 4 – 5 riders. The rides out are calm and always accompanied by a qualified guide. 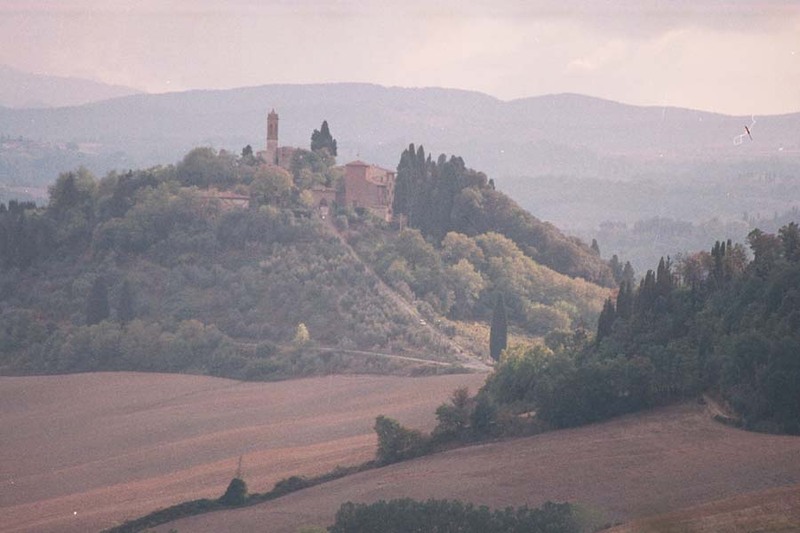 In most cases you will follow small country paths or go across the Tuscan countryside. 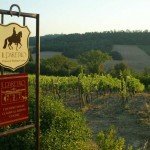 There are also wonderful wine tasting rides and full day ride outs with a picnic. 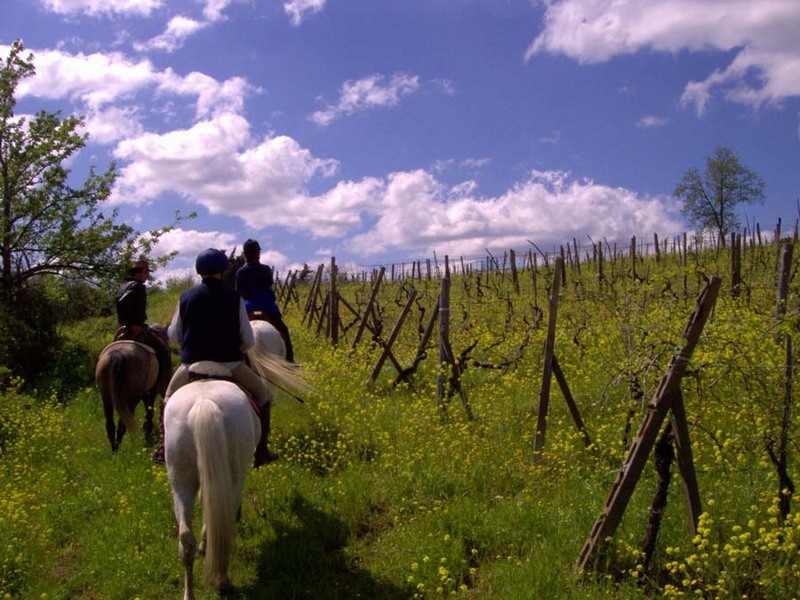 Both Giovanni and Cristina De Marchi were born with a very strong passion for horses. 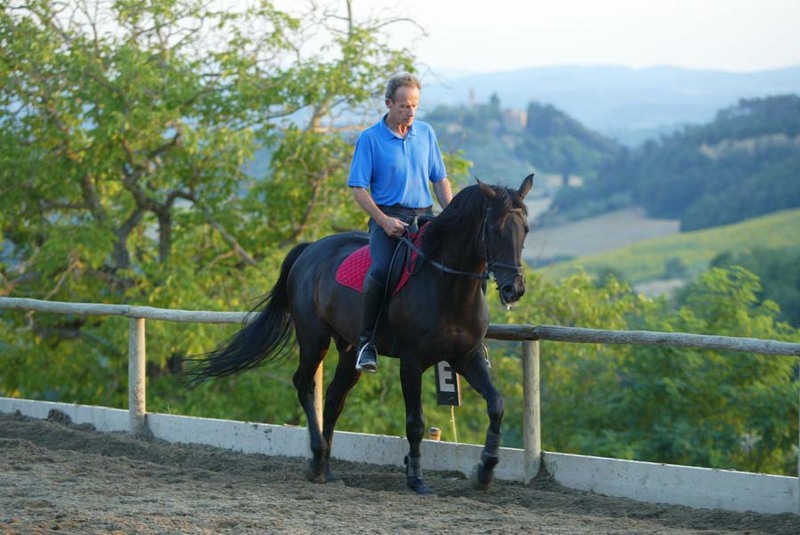 Giovanni started to ride when he was just 10 and his first teacher was so impressed by his pupil’s passion that he personally used to go to pick him up from the train station and drive him to the riding school. 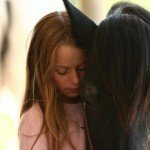 Cristina, started as a child to train (or at least try to train) any animal available ranging from hamsters, cats, dogs and even crickets, making them do show jumping! She inherited her passion for horses and horseback riding from her grandmother, who herself inherited the passion from the family. 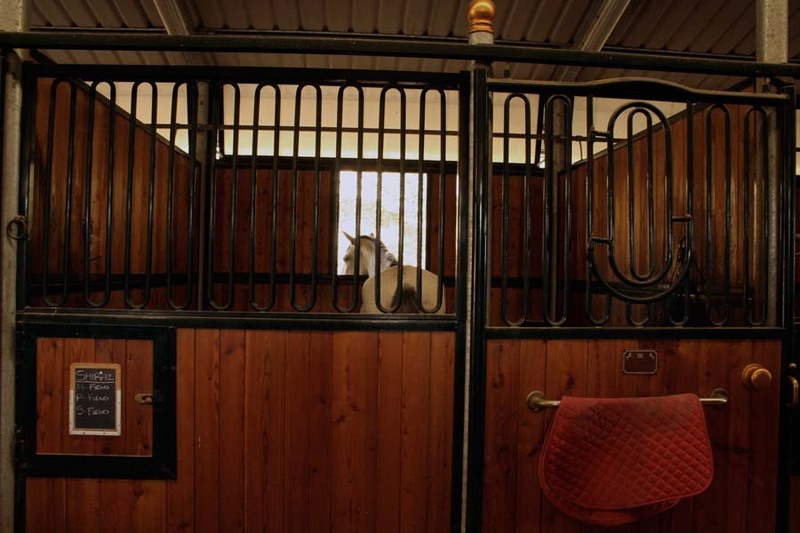 The couple met very young and 18 years ago they decided to dedicate their lives to their passion for the equestrian art. 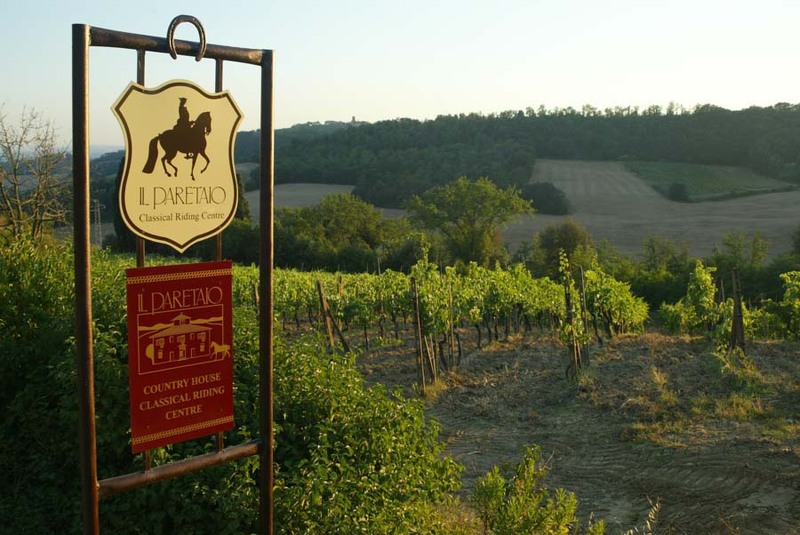 They moved from Milan to Tuscany to one of the most beautiful spots in the Chianti area where they founded the equestrian riding centre – Il Paretaio. 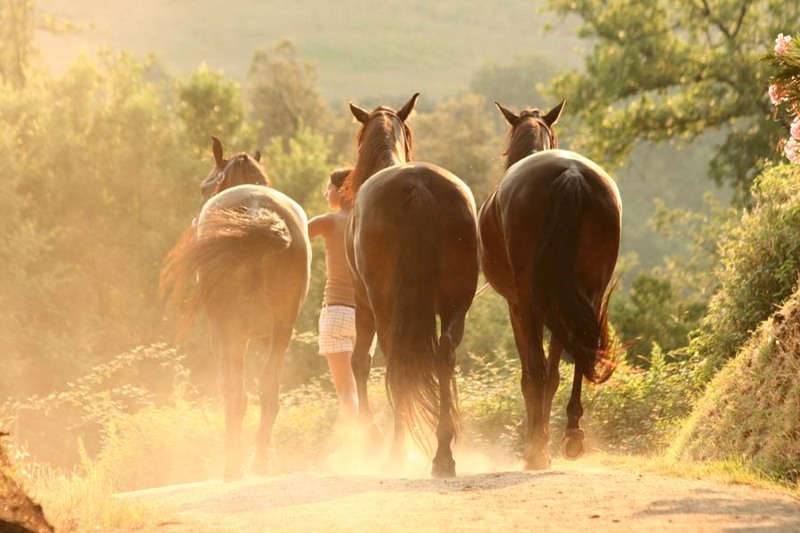 Their brilliant career as trainers started in Milan when they encountered a French master and later, Albert Moyerson, a very reputable horseman and pupil for many years of the great Nuno Oliveira. At Albert Moyerson’s centre they had the chance to meet the great Master, Louis Valenca, one of the chief riders in the Portuguese Equestrian School. 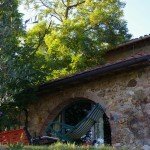 Both Giovanni and Cristina started to study with this Master at his centre Leiziria Grande. After some time they were introduced to the technical director of the National Stud in Portugal, Mr Pedro de Almeida, with whom they studied for many years, assisting with the training of the horses at the National Stud. 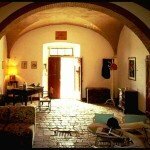 Pedro De Almeida, who was also a pupil of Nuno Oliveira, is still their main reference Master. 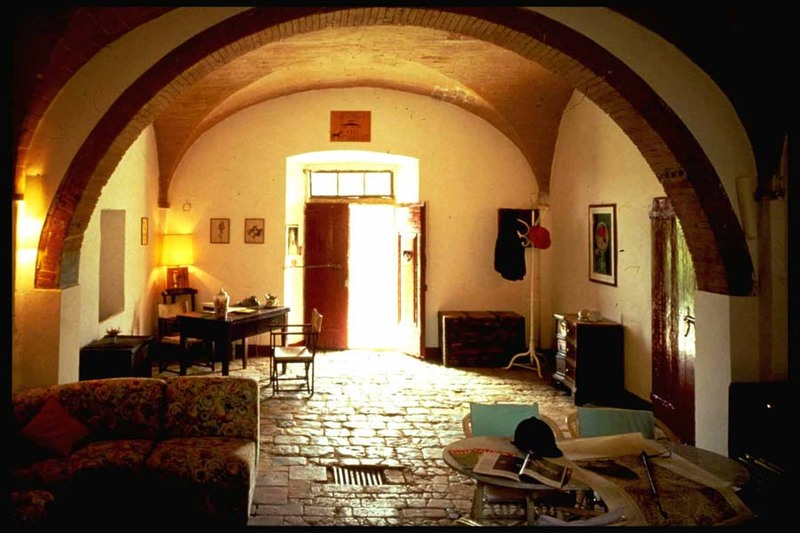 Following the classical principles and equitation with an Oliveiran approach, Giovanni and Cristina were able to create a little corner of paradise, with more than 30 horses and 10 rooms for their pupils. 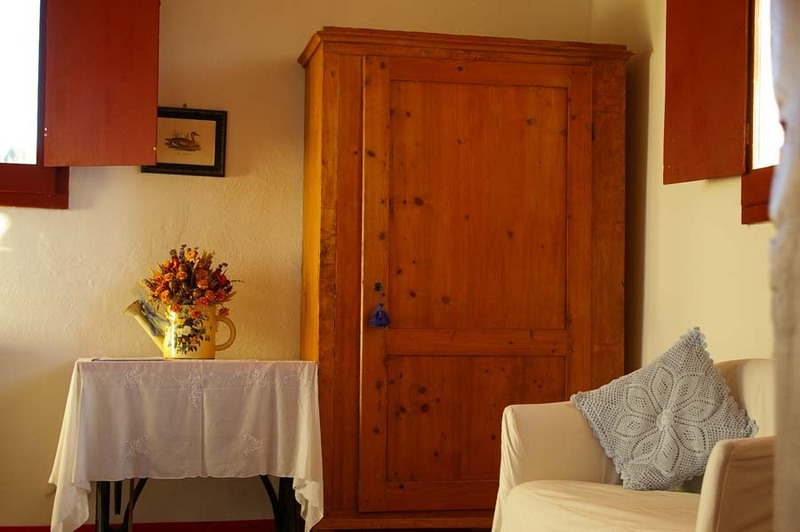 At Il Paretaio, you can feel a sense of harmony, beauty and balance wherever you turn. 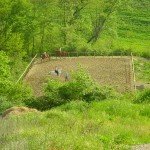 This training method is based on suppling and loosening up the horse to achieve elasticity and lightness in the use of the aids. 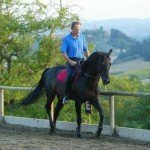 It follows the very traditional principles of classical riding but which are also practised by riders competing in modern dressage. 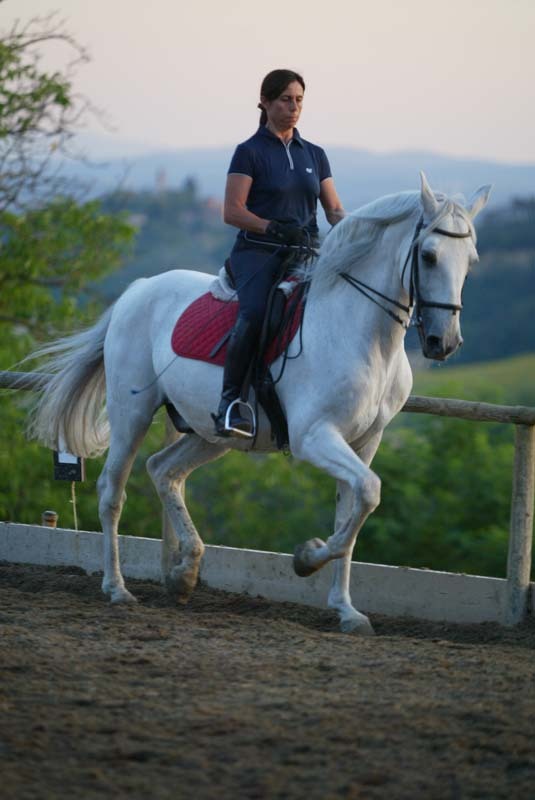 When Cristina & Giovanni teach, they feel they are physically and emotionally riding with the pupil. 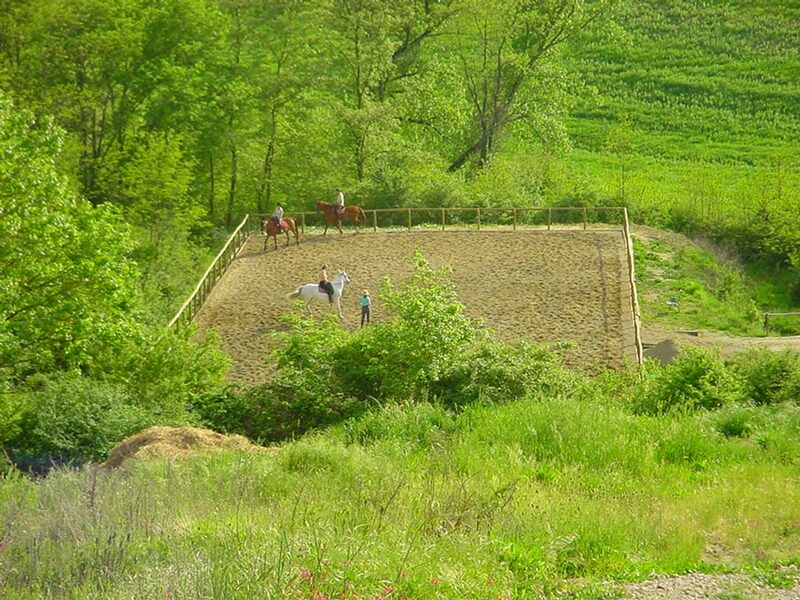 Courses here range from riders just starting out in dressage as well as for experienced dressage enthusiasts. 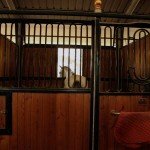 Weekly courses run throughout the year and it is possible to partake with or without your own horse. 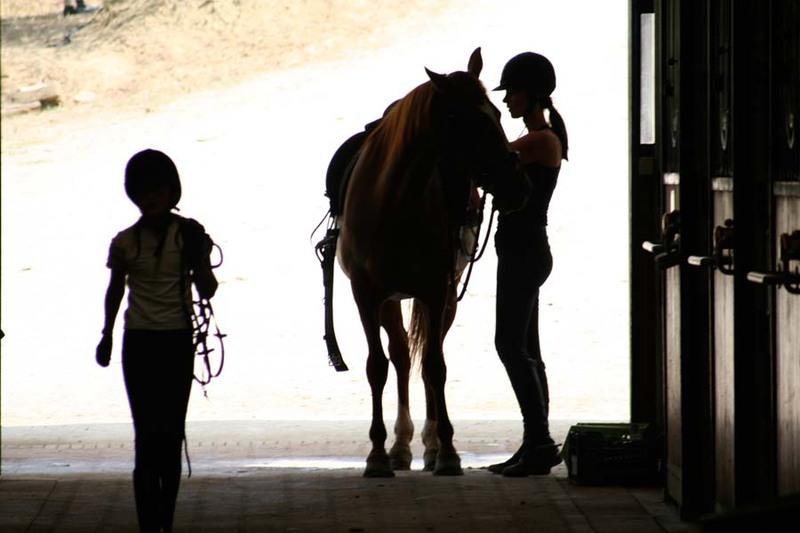 With the emphasis on correct basic schoolwork, riders are also encouraged to work on exercises in the lateral movements, transitions, canter and counter-canter, as well as work from the ground. 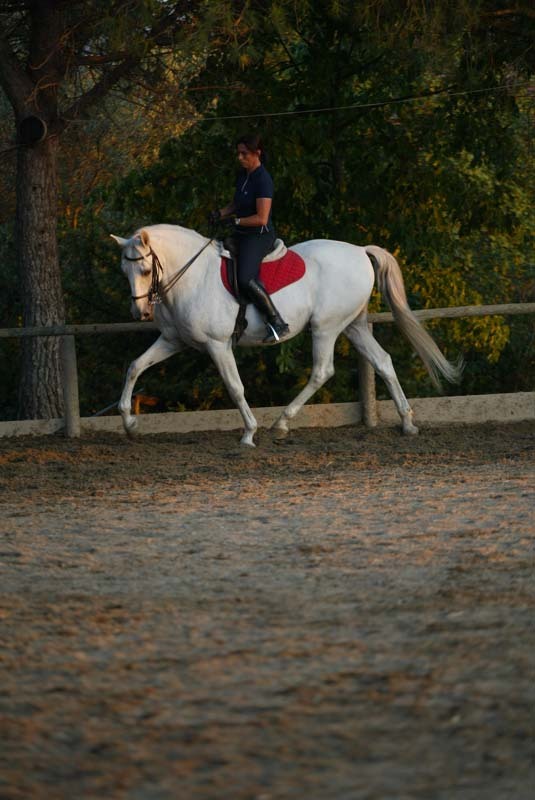 For very advanced levels, sometimes riders also have the possibility to work on more advanced movements. 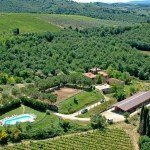 It is also possible to arrange 3 day clinics for individual lessons from Crtistina & Giovanni in your own country – they travel across Europe teaching. Children from the age of 2 can learn to ride here. 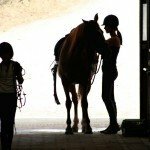 In addition, there are fun vaulting lessons, plus the chance to compete in small competitions and dressage displays.